An emergency responder carries an orange case containing FINDER, which will be used to locate people trapped under debris. NASA search-and-rescue technology has been sent to Mexico following the series of earthquakes that shook the country last week. The suitcase-size device, dubbed FINDER, uses radar to detect human heartbeats under rubble. The device was developed through a collaboration between NASA's Jet Propulsion Laboratory (JPL) and the Department of Homeland Security. Two private companies have licensed the technology. 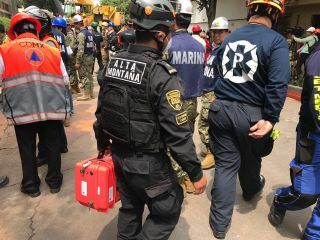 As of Thursday, Sept. 21, one of the companies, called SpecOps Group, was in Mexico City participating in rescue operations, NASA officials said in a statement. The other company, R4, sold FINDER units to Quito, Ecuador's, fire department following an earthquake there last year. That fire department has dispatched these units to Mexico City, according to the NASA statement. FINDER, which stands for Finding Individuals for Disaster and Emergency Response, uses low-power microwave radar to detect small movements, like breathing or heartbeat, beneath rubble. In tests, it can detect a heartbeat through 30 feet of rubble or 20 feet of solid concrete, NASA officials said. The technology was developed from JPL's efforts to design low-cost, small-spacecraft radios, using signal-processing techniques created to measure small changes in spacecraft motion. The goal is to increase the number of people emergency responders can find within what they call the golden hour. This is the 1-hour period after trauma in which a victim's chances of survival are highest. The device can provide results in less than a minute, according to a fact sheet by the Department of Homeland Security's science and technology directorate. FINDER helped emergency crews locate four men trapped beneath the rubble of Chautara, Nepal, following the 7.8 magnitude earthquake that hit the region in 2015, according to the statement. "Our hearts go out to the people of Mexico," Neil Chamberlain, task manager for FINDER at JPL, said in the statement. "We're glad to know our technology is being used to make a difference there."